1. Section 31 — The secretive intelligence organization was written into the Federation charter at its founding in 2161 but operated off-the-grid ever since. Star Trek: Deep Space Nine showed us, though, that even if Starfleet was unaware of its activities, it ultimately supported Section 31’s agenda to protect the Federation via cloak & dagger means that it could never officially sanction. Star Trek: Enterprise also showed Section 31 in its infancy. And now Star Trek Into Darkness presents Peter Weller’s Admiral Marcus as the head of the secretive intel agency — that’s how he got off-the-books funding to build the USS Vengeance. Also, on Deep Space Nine, Section 31’s do-anything-to-win mentality meant they kept trying to recruit the genetically engineered Dr. Bashir (Alexander Siddig), just like they hired genetic superman Khan Noonien Singh in Into Darkness. 3. Nurse Chapel — Carol Marcus tells Kirk of his reputation among Starfleet’s female members and that she holds that against him. Especially because she’s a friend of Christine Chapel. If you don’t know who that is, she was the Enterprise‘s nurse on The Original Series, and was played by Majel Barrett, the future wife of Gene Roddenberry (and the voice of all the computers on every subsequent Star Trek show). To hear she had a romance with Kirk is a surprise, because in the episode “The Naked Time” it’s revealed she actually has feelings for Spock. 5. Scotty’s Sabotage — When Scotty sabotages the USS Vengeance to prevent it from firing on and destroying the Enterprise, it recalls that great moment in Star Trek III: The Search for Spock when James Doohan’s Scotty disables the Excelsior‘s transwarp drive so that it won’t be able to pursue the Enterprise after Kirk & Co. steal it. 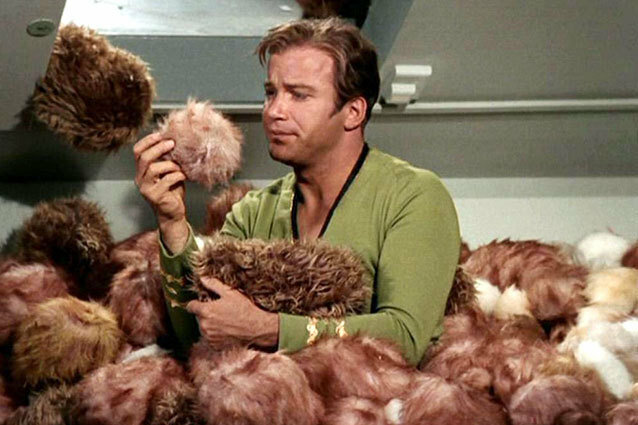 Kirk was famously annoyed by the little furballs in “The Trouble With Tribbles.” In Star Trek Into Darkness, though, a Tribble that had been injected with Khan’s blood helps saves his life after he dies, Wrath of Khan-style, from radiation poisoning. 7. Harry Mudd — When preparing to lead the away team down to the Klingon homeworld of Qo’noS, Kirk mentions they captured a merchant freighter during the “Mudd Incident.” Meaning that he and his crew have already encountered notorious 23rd century con man Harry Mudd, the only nemesis other than Khan to tangle with Kirk more than twice onscreen. 8. Trojan Horse Beaming — Spock gets the better of Khan in Into Darkness by doing a variant of Kirk’s badass transporter tactic in The Search for Spock. In that movie, Kirk and his crew beamed onto the Genesis planet at the same moment they beamed over a Klingon bording party onto the Enterprise. The only thing the Klingons didn’t know was that the Enterprise was counting down toward imminent self-destruct. It blew up…with all of them aboard. In Into Darkness, Spock does something similar. He agrees to beam over the 72 torpedoes containing Khan’s crew to the USS Vengeance in exchange for Kirk, Scotty, and Carol Marcus. Spock does beam 72 torpedoes over…but they’re armed weapons and aren’t containing the Botany Bay crewmembers at all. When Khan reveals his true teachery, Spock orders them to detonate, disabling the Vengeance. 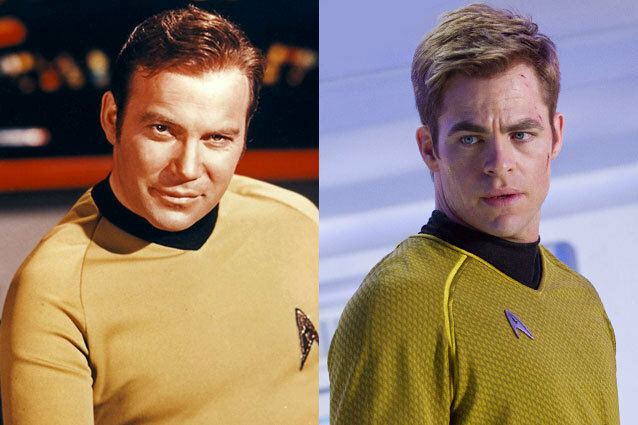 Star Trek: Enterprise, the least-beloved of the Star Trek series is also, like it or not, the only one that remained unaffected by the altered timeline from J.J. Abrams’ 2009 film. That’s because it was a prequel show set a century before the events of the new movies. So at one point when Kirk is meeting with Admiral Pike at Starfleet Headquarters in San Francisco you actually see a little model of Capt. 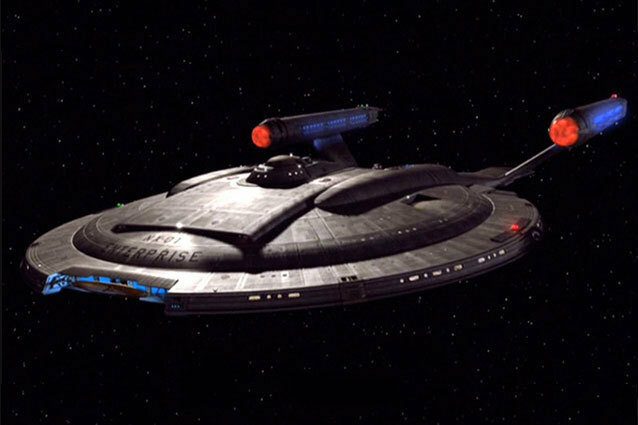 Jonathan Archer’s command from the show, the Enterprise NX-01, Earth’s first deep-space exploration vessel.